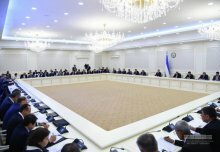 On July 4, a meeting dedicated to issues of targeted and systematic work with youth, creating decent conditions and providing employment for young people was held under the chairmanship of the President of the Republic of Uzbekistan Shavkat Mirziyoyev. This was reported by the Press Service of the President of the Republic of Uzbekistan. One of the important directions of reforms, we outlined comprehensive support and creation of conditions for each young man to occupy a worthy place in society and carrying out large-scale work in this direction, said Shavkat Mirziyoyev. On the basis of the youth movement “Kamolot” we formed the Youth Union of Uzbekistan, we are introducing a new system and approaches to work with youth. On June 30, the Youth Day was celebrated in our country for the first time, a good new tradition is laid. However, many shortcomings in working with youth were noted. Pomposity and superficiality in activities of the Youth Union, the lack of attention paid to targeted working with youth and solving their problems were criticized. Most of the leaders of 4 sectors at places are still not fully engaged in youth issues. The work in this direction and departments of internal affairs, committees of makhallas, other public organizations, educational institutions is not at the proper level. The activity of deputy khokims of districts (cities) on issues of youth policy, social development and spiritual enlightenment work, deputy heads of district departments of internal affairs on youth issues also cannot be considered satisfactory. In some cases, responsible positions on youth issues remain vacant. As a result, the socially significant issues of youth remain without attention. Youth, left without supervision and control, commit crimes. In this regard, the Youth Union, relevant ministries and departments are given tasks on improving work with youth, eliminating neglect, lack of control, drastically reducing crime among youth. It was noted that in Kuyichirchik district of Tashkent region and in Chilanzar district of the city of Tashkent, a new system of ensuring youth employment and their training in specialties and business skills in demand on the labor market was tested. To this end, a working group was formed comprising representatives of responsible departments and a district passport was developed with the data of youth at the age from 14 to 30. The makhallas have been allocated buildings and areas for organization of “Labor Guzars of Youth” and enterprising entrepreneurs are involved. Youth who want to engage in fish farming, gardening, trade is allocated necessary funds and resources. More than 1.5 thousand problems of youth have been identified, more than 1 thousand of them have been solved at places, and measures have been taken on resolving 500 of them. Based on the results of the experience, the State Program “Youth is our future” was adopted, aimed at supporting implementation of business initiatives, start-ups, ideas and projects of youth, increasing their socio-economic activity. From July 1 this program began to operate in all districts and cities. Under the Youth Union, “Youth is our future” and its district (city) branches are formed. This year, the Fund was allocated funds of 770 billion sums. Preferential loans at a 7 percent annual rate will be allocated for business projects of youth from the Fund. The Program specifies the amount of loans allocated in each district and the number of recipients, the areas of activity for which loans are issued, the number of jobs that need to be organized on the basis of using the received loan. The program envisages the introduction of a new mechanism – attaching at places to farmers 1 person from among the unemployed youth, providing them with job by allocating one hectare of land. At the meeting, tasks were given on systemic organization of work in this direction, ensuring regular control over effective use of the Fund’s resources, eliminating at places problems impeding the implementation of business projects for youth. Khokims and sector leaders should personally meet with each of unorganized, unemployed youth, communicate with them, as if with their son, study problems, be his companion and, above all, take measures for ensuring his employment, said the Head of the state. At the meeting attention was drawn to the issue of spiritual education of youth, their protection from the impact of harmful currents and alien ideas. If we do not engage in upbringing children, check their behavior on a daily basis, educate them, train them, provide them with jobs, it will be difficult to protect them from harmful influences, said Shavkat Mirziyoyev. Tasks were given on intensifying spiritual and educational work with youth, strengthening ideological immunity in young people, organizing their free time. Tasks were also set for preventing early marriages among underage girls and divorces. Due to the fact that officials and local leaders participated at the meeting, an important issue related to measures for cotton care was also considered. It was noted that in connection with weather conditions – lack of rain and cool temperature – the development of cotton lags behind by 10-15, in some places – by 20-25 days. Instructions were given for eliminating the backlog in development of cotton and accumulation of a guaranteed crop. This year, the state created conditions that did not exist in previous years, and accordingly, farmers should give a positive response. We do not need a farmer who, as previously is chasing a plan, does not think about income and works without a definite calculation. We need cotton not to fulfill the plan, but to create jobs, increase the incomes of the population and the standard of living, the President said. At the meeting, the period from July 5 to September 5 was declared “Impact two months of harvest accumulation”. The work that needs to be implemented in this direction is planned.